There are several bus stations near the Seattle House. The closest bus lines are the 65/67 and the 75. For a detailed map of the local bus routes, click here. For help in planning trips by bus, consider downloading the Puget Sound Trip Planner or OneBusAway apps for iPhone and Android. The LINK Rail system is a convenient way to reach downtown Seattle and Seatac Airport. The closest LINK station is the University of Washington Station, two miles from the Seattle House. It can be accessed by foot, car, or bus. Both the local bus lines and the LINK rail accept cash or ORCA cards as payment. For help obtaining an ORCA card, please visit the ORCA website. Ride-sharing apps, like Lyft or Uber, are popular for short trips. There are usually enough drivers in the area that a car can arrive within a few minutes of a request. For short-term car rentals, you can download the car2go or ReachNow apps. These services offer access to cars that are parked on city streets throughout Seattle. Boutique grocery store offering high-end staples and ready-to-go food. The closest shopping mall to the Seattle House is University Village, located approximately one mile from the House. It contains many restaurants, shops, grocery stores, and pharmacies. The stores at University Village include Pottery Barn Kids, Gap, Banana Republic, Crate & Barrel, and more. Click here for a full directory. This park is adjacent to the House and features a walking path, play structures, basketball courts, and picnic tables. This multi-use trail runs near the House and is popular with cyclists, joggers, and walkers. To the east, it continues to Magnuson Park. 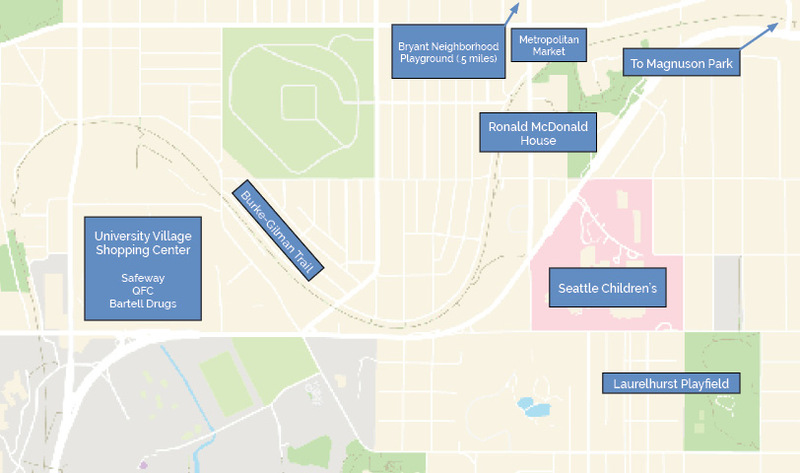 To the west, it continues to the University District, Fremont, and Ballard neighborhoods. The playground is appropriate for children of all ages offering climbers, decks and platforms, ladders, a pipe barrier, slides, a spring toy, swings, a track ride, a transfer station, and a whirl. This park also has basketball hoops, two fenced tennis courts, and large open spaces perfect for playing. This sports complex features tennis courts, ball fields, and a children’s play area. This large park sits on the coast of Lake Washington. It contains beaches, walking trails, picnic areas, a 20,000 square foot play area, and much more! Definitely the premiere park of Northeast Seattle. Volunteer barbers visit the House periodically to give free haircuts to our residents. Check the posted schedule to see if any are visiting soon. Here are some other local options. Offers swimming lessons, lap swimming, family swimming, a rope swing, and more. This University District theater offers reserved seating and unique dining options. During the summer months, this theater offers $1 showtimes for morning movies. Check their website for more info. There’s a lot more to Seattle than just the neighborhood around the House! Ask at the Front Desk about passes to the zoo or aquarium. They can also provide information and directions to downtown tourist sights, sporting events, and more. Many museums in the Seattle area offer free admission on the first Thursday of the month, and others offer free admission to children all the time. Check this list for more info about specific museums.